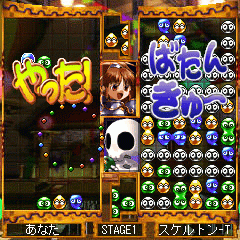 The pun of the title stretches the second “Puyo” to end in an “n” to form the syllable “yon”, which is Japanese for “four”. 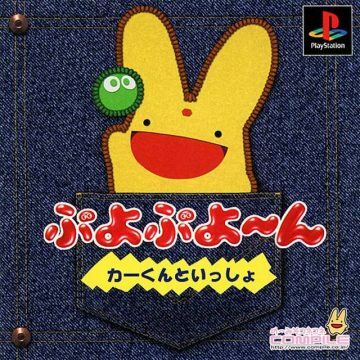 Other than the previous titles, there isn’t any gameplay application for it in this game, so it is just a pun for the sake of being a pun. 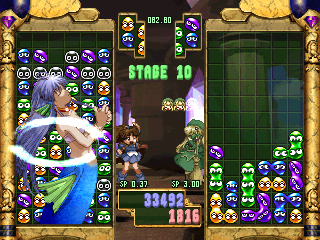 Since Sun Puyo didn’t exactly pan out so well in the last game, Compile decided to remove them, which was definitely a step in the right direction, considering all the problems they caused. 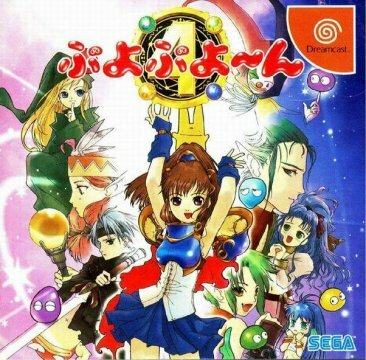 Unfortunately, this left the creators in a weird spot – how would they continue to improve? After all, if they wouldn’t bring anything new to the table mechanics-wise, the next game would just be kind of stale – we couldn’t have Puyo Puyo Tsū-styled games forever. 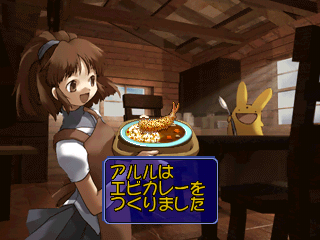 So Compile decided to bring in special skills for the characters, which can be used by consuming one point of SP. Both sides have 1.00 SP at the start of a match, but gain fractions of a point for clearing Puyo. 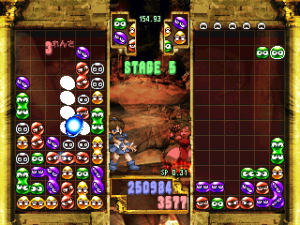 Special skills are a pretty good idea on paper. 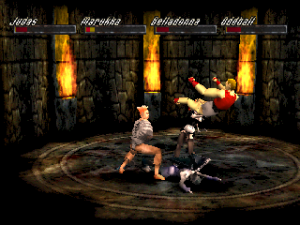 It makes every character even more distinctive, provides more of an incentive to try everyone out and allows more people to find a playstyle that suits them. 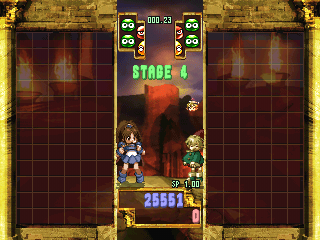 Compile also decided to add gimmicks to certain stages in the story mode to pump things up a bit. 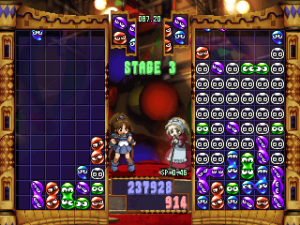 Unfortunately, the game doesn’t exactly play as well as Compile hoped, mostly because these factors add up to make the game quite slow, in stark contrast to Puyo Puyo SUN‘s rapid matches. 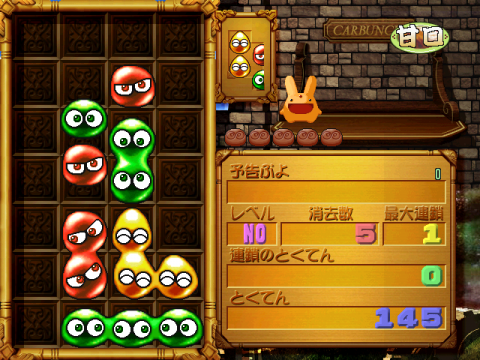 Many of the special skills are focused on erasing Puyo, like Kikimora’s skill that erases all Nuisance Puyo from her board, Seriri’s skill that enables her to clear any non-connected Puyo (Puyo that aren’t adjacent to any of the same color), Draco’s skill that clears the color Puyo with the larges number, and so on. 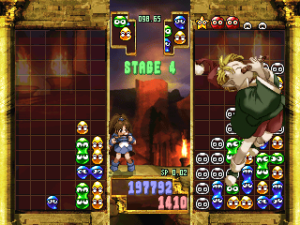 Since all these skills make it easier to keep the board free of Puyo, battles tend to drag on for quite a while, as everyone is certain to use their skills the moment they’re in a pinch. Victories that seemed to be assured can be easily undone with the press of a button, forcing both parties to start over from near scratch, especially given how quickly SP can be gained with some characters and how much can be held over at a time. 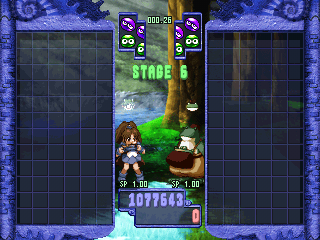 Since it’s possible to simply sit on 3 full points of SP and wait until the time is right before activating them and most likely gain more points from the second wind, battles usually carry over into Margin Time. 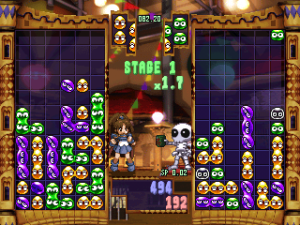 The only exception to this is if someone is able to make a larger than normal chain (a five chain is usually enough to do the trick in earlier games, though certain skills can deal with a seven or eight chain). 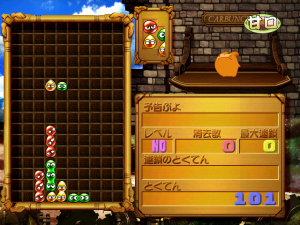 There’s no way to disable the skills when playing, which is unfortunate, because the game could have been much better without them. 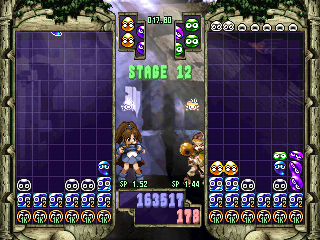 Also adding to the slow nature of the game is the way the Puyo drop. In previous games, when placing a pair of Puyo horizontally on top of a single Puyo, the overhanging Puyo would drop down immediately, but here it hangs in the air for roughly a half second before finally dropping down. 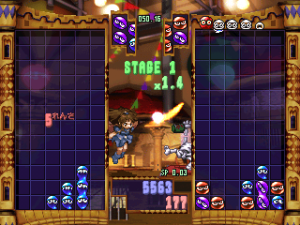 Although it initially sounds like a small amount, this scenario is encountered many times in a regular match, so it can get very grating very, very quickly. This also sort of shifts the balance of the battles in favor of the player that has to swap the least, especially in situations where a chain is required quickly for an offset. 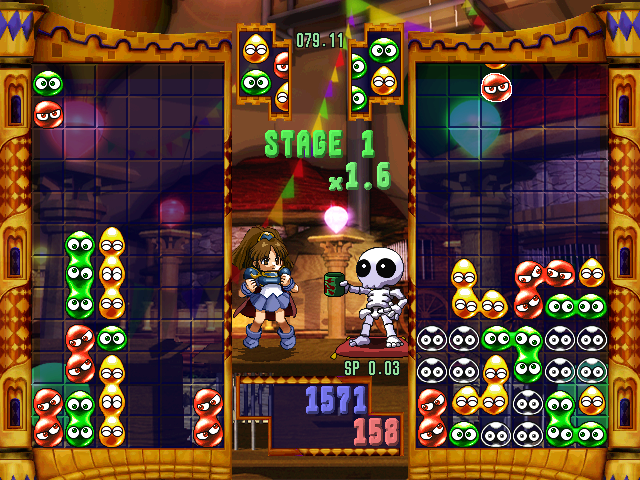 The practice of good ideas that fail on execution unfortunately extends to story mode, the main attraction of the game. 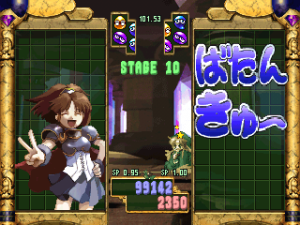 Once again playing as Arle, you gain allies at certain points during the mode, which let you use their skills in further battles (you’re not allowed to use Arle’s special skill for a reason relating to the plot, though the opponents can use theirs just fine). The main gimmick here is that there is no main gimmick – different stages have different groups of gimmicks. Although this allows for a good deal of variety, many of the gimmicks aren’t for the best. 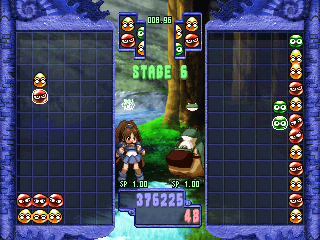 The gimmick for stages 3-5 is that only one row of Nuisance Puyo falls at a time, instead of the usual up to five rows. 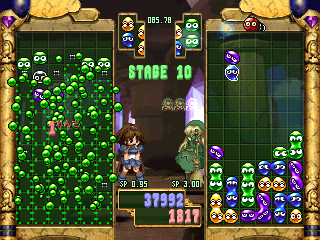 Stage 11-13 start with Nuisance Puyo already on your field. 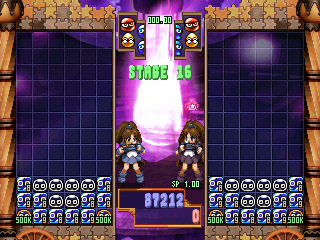 There’s even a stage gimmick where all Puyo drop much slower than usual. 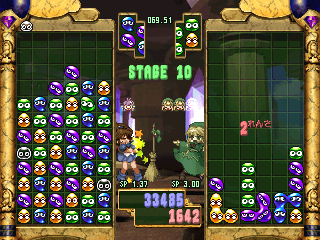 Although 16 stages may not seem like a lot in the pace of a normal Puyo match, the special skills make story mode a very lengthy experience, one that really shouldn’t be completed in one go. 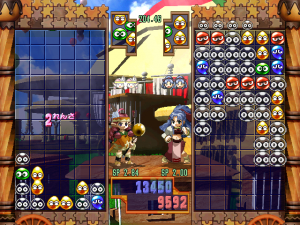 Just like in the previous game, though, you’re allowed to save your progress, so at least you can take breaks when the game gets too much to handle. 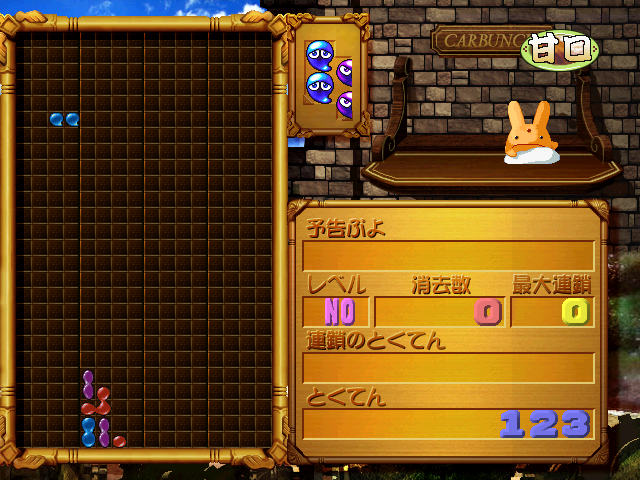 Thankfully, there’s still a lot more to do than just the story mode. 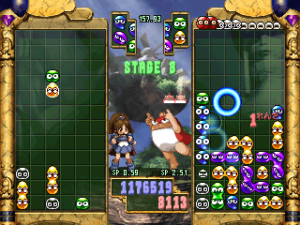 The traditional endless (with three sizes for the board) and multiplayer modes return, but there’s also a four-player mode, just like the super Famicom version of Puyo Puyo Tsu. 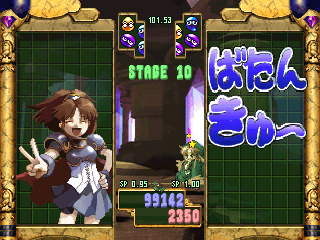 The puyo battles are still the standard ones (with skills). 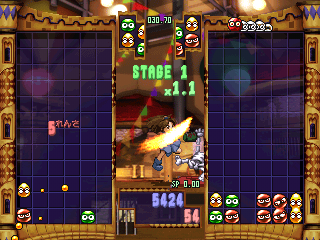 Although this isn’t necessarily a bad thing in itself since this has become the norm by now, additional options, like the ability to play with some of the gimmicks from story mode, would have been welcome. 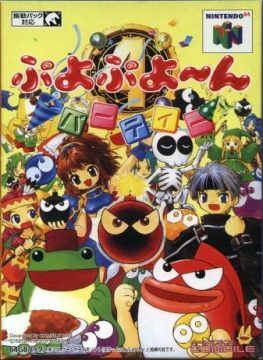 Even though the gimmicks didn’t really help the story mode, it would have been nice to play them with friends, for variety’s sake. 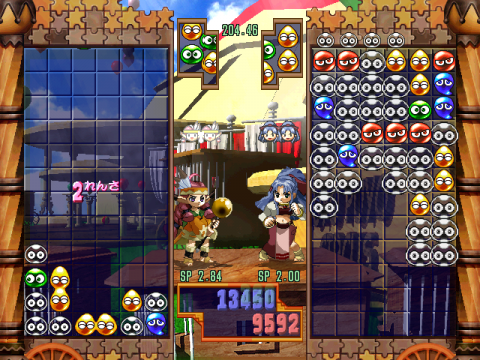 Sega did mix things up with Mission mode, however; now it’s a time attack mode where you have to clear a certain amount of missions, with varying stages of difficulty. It’s quite obvious Compile put a lot of work into the game. 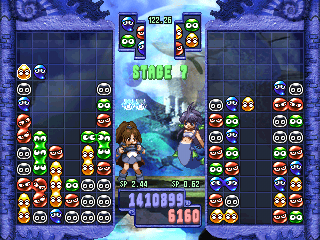 The art for everything is gorgeous, the music is all rather catchy, and the characters are always on screen during battle. They constantly react to the tide of battle upon casting spells, getting hit, and being close to losing – not unlike Capcom’s Puzzle Fighter. Adding on to the Dreamcast version, the Nintendo 64 and PlayStation ports have a sort of abridged story mode, as well as a survival mode where you’re tasked with battling as many foes as possible while under the control of Arle – unlike story mode, you can use her special skill here, so things are a bit more balanced in your favor. Aside from having been released a whole nine months earlier than the rest, the Dreamcast version does look a bit better thanks to the higher resolution and a few graphical tricks here and there. Both the N64 and PlayStation versions are mostly identical to each other in terms of graphics and modes. 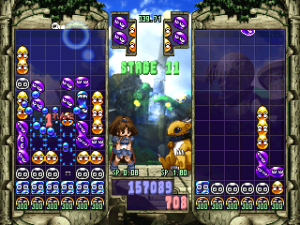 All in all, Puyo Puyo~n isn’t a completely terrible game – you may find yourself enjoying it at some times if you relax enough. 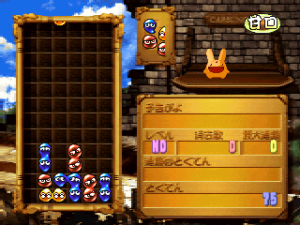 However, it certainly isn’t the strongest entry in the series, due to its numerous flaws in the new features that are cannot be deactivated. If the special skills were readjusted and the overall pace of the game faster, it could very well have been a strong entry in the Puyo Puyo series. 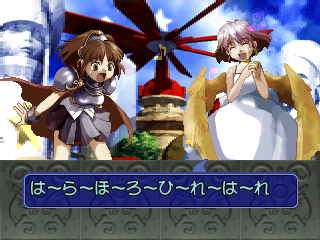 But at the bottom line, if you’re not a master and able to create large chains, the game is going to drag on for a very, very long time. 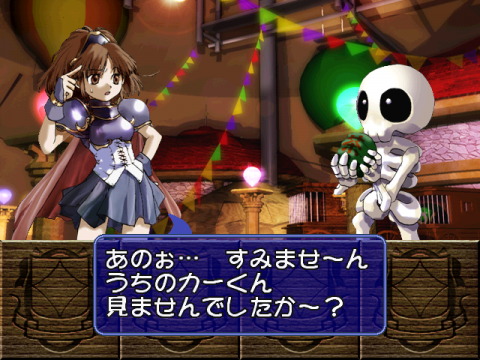 The last in the Pocket series actually tries to fix all of the slowness issues that the base game had. It does this in a variety of interesting ways, and although it’s difficult to tell if it is better or worse than the base game, it’s certainly worth looking into. To start, one of the most immediate things to notice is that the Sun Puyo mechanic is still present in this game – this is because the engine has been copied straight from Pocket Puyo Puyo SUN. This is somewhat of a good thing, as it means that the base game isn’t as slow anymore. 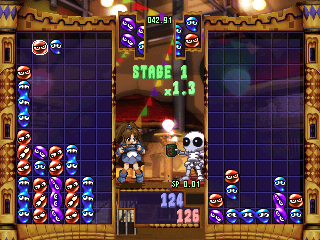 Through mixing two games at opposite ends of the spectrum – one far too fast and the other far too slow – it seems to be trying to create some kind of balance, but it unfortunately doesn’t work out that well. 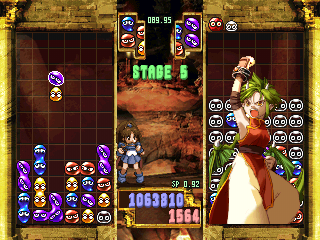 Although matches can seem to go either way for both players at the start, once Sun Puyo are introduced into the battle, they are decided quickly if someone manages to set up even one good chain. 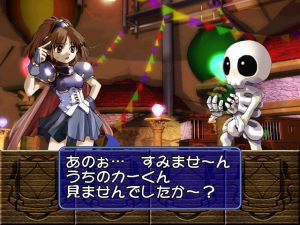 A few things have been reworked, though, making the game somewhat of a new experience. First, the progression of story mode has been changed. Instead of facing foes one after another in a fixed path, you’re given a set of three opponents to face. 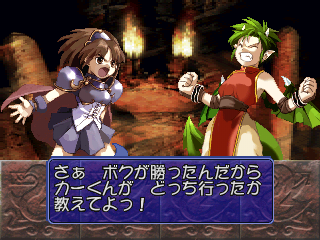 You’re free to choose any you want to fight, but you won’t be able to progress to the next set of the story until you fight the third opponent, who is signaled with a crown above their head. 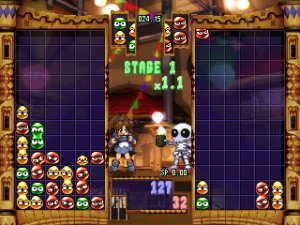 Perhaps the most important change is that all of the special skills have been redone in a furhter attempt to balance out the game. 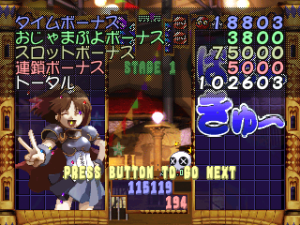 Although a few special skills still center on clearing Puyo, it’s a considerably lesser amount in this game. 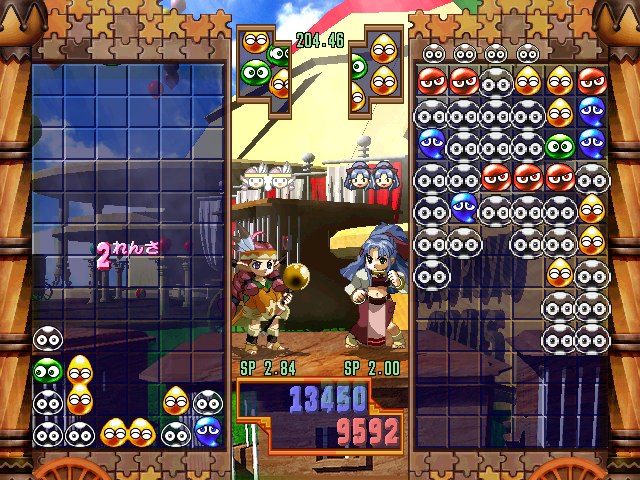 A lot of skills are now offensive: for example, Schezo’s skill places hard Puyo on the opponent’s grid instead of clearing out his own Puyo in an “X” pattern. 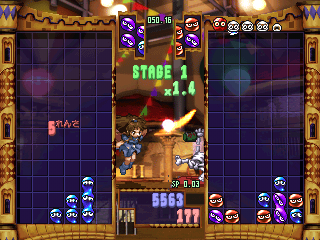 Unfortunately, special skills cannot be used initially, but need to be unlocked by playing the new “Challenge Mode”, which is basically an endless mode where you fight opponent after opponent. Defeating an opponent enough times in this mode finally unlocks their skill for you to use in every mode. 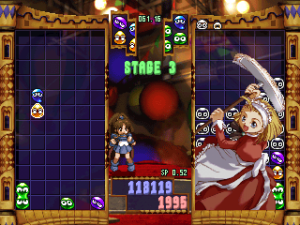 It may seem like a great deal of work just to use a skill, though defeating an opponent in story mode more than halves the number of battles you need to win against them. Since the engine is copied over from Pocket Puyo Puyo SUN, the music sounds the same, and some songs are directly copied from the previous game. Endless mode and mission mode are also copied over, with no additions. All in all, the game is better than Pocket Puyo Puyo SUN, as there’s a bit more to do. 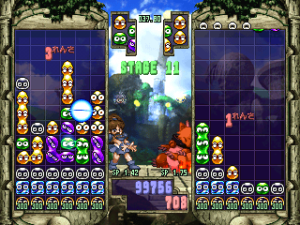 Comparing it to the base game of Puyo Puyo~n is a bit difficult, however; although a few aspects have been reworked, the inclusion of Sun Puyo by default in all modes and the special skills being locked may throw many off. 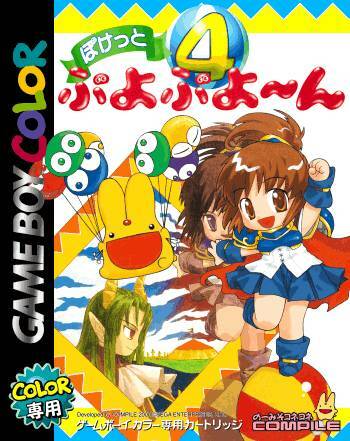 At the very least, Pocket Puyo Puyo~n offers a thoroughly different experience from the base game and is therefore the most noteworthy of the Game Boy versions.